The Federal Aviation Administration (FAA) defines a safety management system (SMS) as a "system to assure the safe operation of aircraft through effective management of safety risk…designed to continuously improve safety by identifying hazards, collecting and analyzing data and continuously assessing safety risks. "1 SMS has four main elements: safety policy, safety risk management, safety assurance, and safety promotion. The FAA is pursuing several SMS initiatives simultaneously as part of an international effort to implement SMS throughout the aviation industry. The FAA has said it will implement SMS for all aviation components that it oversees or regulates: airports, air carriers, and air traffic. This discussion paper focuses narrowly on FAA’s SMS initiative for airports. On July 14, 2016, the FAA published a Supplemental Notice of Proposed Rulemaking (SNPRM) that modifies the NPRM and addresses many, but not all, of the comments submitted in response to the NPRM. The major changes from the NPRM to the SNPRM, as well as a summary of potential issues with the SNPRM, is included in sections II and III. (3) Airports that have more than 100,000 total annual operations (according to best available data).4 The SNPRM uses 2012 data but there are few changes in this list since 2012. In addition, unlike the NPRM, the SNPRM includes a requirement for recurrent training every other year and also would require the update of publications for the hazard awareness orientation requirement on the same schedule.8 The FAA believes this revision will limit the pool of employees that must be trained to approximately 3 to 10 people per airport. Is the FAA's assertion that between 3 and 10 employees per airport will need training an accurate estimate? Will the SNPRM training requirements be cumbersome, time consuming, and/or excessively costly? What types of individuals, and how many, would be affected by an obligation to train certain individuals with access to the movement and non-movement areas? How would the airport develop and administer a training program? What will be the administrative and recordkeeping implications of the SMS training program? 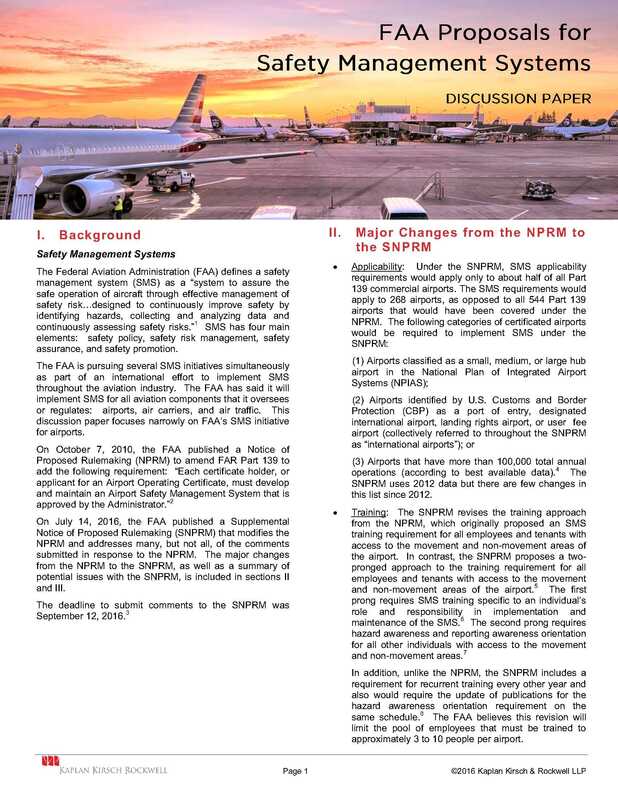 Implementation: The SNPRM extends the timeline for submission of an implementation plan to within 12 months of the effective date of a final rule and submission of the SMS manual and/or Airport Certification Manual update to within 24 months of the effective date of the final rule.10 This extends the one-year timeline established in the NPRM. The FAA believes this time extension will help airport sponsors in their implementation process. Whether and how the airport will work with state and local legislators to provide additional protection from data and disclosure. Whether to submit additional comments to the SNPRM regarding the scope of data disclosure and its potential chilling effect on voluntary reporting by private entities. In addition, the FAA received over twenty-five comments regarding the application of SMS in the non-movement area.23 The FAA disagreed with these comments because aircraft and airside personnel routinely flow between the two areas.24 As a result, like the NPRM, the SNPRM applies SMS to both movement and non-movement areas. Accountable Executive: Under the SNPRM, each airport sponsor must identify an accountable executive who will have control of the human and financial resources for operations conducted under the Airport’s Operating Certificate and has ultimate responsibility to the FAA for the safety performance of operations conducted under the Airport Operating Certificate. The FAA expects in most instances that the airport director would be designated the accountable executive. Who would assume the role of the airport's accountable executive under the revised definition of the SNPRM? Would the accountable executive have the time and ability to fulfill the obligations of the position, in addition to other existing responsibilities? Would changes in delegations and authorities to the accountable executive be necessary to ensure that the individual has the "ultimate responsibility" required under the SNPRM? Would the prospective accountable executive need additional training to fulfill the obligations to implement SMS? Would the accountable executive need additional delegation of authority from the local elected body? Would the airport have to amend the airport organizational chart, position descriptions, internal procedures, manuals, or other internal documents to account for these new responsibilities and reporting obligations, including providing "whistle-blower" protection for employer reporting hazards? Slightly revising the definition of an accountable executive that allows airport directors to assume the role of an accountable executive. Throughout the SNPRM, the FAA requests input and comments from interested parties who may be impacted by the proposed changes in the SNPRM. Airport sponsors and other interested parties should take advantage of this opportunity to provide input and, where warranted, request additional information or explanation from the FAA if previous comments or concerns were not adequately addressed. No participant in the aviation industry ever wants to oppose reasonable safety efforts. Nevertheless, the FAA’s SMS initiatives have the potential to pose considerable new administrative, recordkeeping, and oversight obligations on certain Part 139 airports. Airports need to consider how to prepare for these possible new obligations and to identify funding and administrative structures in advance. Although the precise SMS requirements may well change when the FAA considers comments on its proposed rule, it is almost certain that some new SMS requirements will be imposed. How does the narrowed scope of applicability in the SNPRM affect the airport sponsor? Has the narrowed scope gone far enough? Is the airport sponsor comfortable with the data protection provisions outlined in the SNPRM and with communicating with state and local legislators to provide additional protection from data disclosure? What activities not currently covered in the Airport Certification Manual might be included in the SMS Manual? What areas of the airport might be included in the SMS Manual and what level of access and operational control does the airport exercise over each such area? Is it practical to implement all components of SMS immediately and simultaneously? If not, consider commenting to the FAA on a phase-in schedule that might be practical. Can the airport’s existing permitting and security badging policies and procedures be changed to impose SMS responsibilities on airport tenants and users, especially in non-movement areas? What changes in primary regulatory documents (e.g., Rules and Regulations, Minimum Standards) and airport agreements (e.g., leases, permits) would be necessary to implement SMS? What changes in policies, procedures, and regulatory documents would be needed to ensure that airport tenants and users implement mitigation measures identified in the safety risk management process, in addition to existing prescriptive requirements in, for example, Airport Rules and Regulations, Minimum Standards, leases, and permits? This discussion paper is not intended to provide legal advice but is provided as information as a courtesy to our clients and friends. Please contact your attorney for legal advice. If you have any questions or would like to learn more about the topics addressed in this discussion paper, please contact Peter Kirsch at pkirsch@kaplankirsch.com or at 303.825.7000. 1 FAA, Draft Advisory Circular 150/5200-37A, 1 (June 21, 2016) (citing the International Civil Aviation Organization, Safety Management Manual, 6.5.3 ICAO Doc. 9859-AN/4744 (3rd ed. 2013)). 2 FAA, Supplemental Notice of Proposed Rulemaking, Safety Management System for Certificated Airports, 81 Fed. Reg. 45872 (July 14, 2016). A PDF of this discussion paper is available.